Do you know what the Dawes Act of 1887 is? It wouldn’t surprise me if your answer is “no.” But, it is likely you have heard of the notorious Indian land for sale offer. 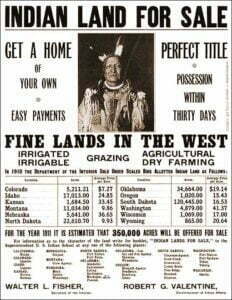 This sale was to support the Dawes Act, adopted by Congress on Feb. 8, 1887, and drive assimilation of Natives into mainstream society. When I was growing up, I remember hearing the phrases “we were separated” and “our land was taken,” though I didn’t realize that these were active goals of the Dawes Act at that time. Discussing the full impact of this act could run for volumes, but strictly speaking, the Dawes Act of 1887 provided Native Americans the opportunity to accept an allotment of land that was surveyed from tribal lands, and be granted United States citizenship in the process. The political examination of the introduction of this act shows another reason as to why it was constructed – specifically to undermine tribal unity. By granting citizenship to those who took the land, the hope was that they would be less communicative and accepting of tribal government — that exposing Natives to the “civilized” white culture would leave them more accepting of it and lead to better U.S. and tribal relations. In the end, the biggest impact of the Dawes Act was a loss of indigenous cultures, tradition and land across the U.S. It did a number on our tribal communities and tried to pit our ancestors against each other. It was by this measure that, after 25 years, those who took the land were given deeds – and this ultimately allowed them to sell the land, leading to the loss of more than 90 million acres that was once treaty land. With the assimilation of so many, a certain amount of culture and tradition was lost within some tribes – a by-product of the loss of land and separation. Today, there are a number of dead or dying Native languages, and many of the indigenous do not know the intricacies of their particular people because the knowledge of those traditions was idle or forgotten. This might be the most long-lasting effect of the Dawes Act, and one of the more unfortunate. When speaking of these topics, we must be careful to not place blame where it doesn’t belong. I, personally, try to stay unbiased in these writings, and only use them to inform others, so that, hopefully, in the future, we understand things like the Dawes Act and can foresee the impact. With so many groups divided, today, we should take the time to look at these divides and ensure we are not being detrimental to our causes or others. This entry was posted in Humanitarian and tagged American Indian, assimilation, Dawes Act, Indian Land, indigenous, Native American, treaty, tribes. Bookmark the permalink. Trackbacks are closed, but you can post a comment.